1. FICTION: The CIA’s rendition program is nothing new and has been going on for decades. Rendition began in 1883 when Frederick Ker was kidnapped in Peru by the Pinkerton Detective Agency and rendered back to Chicago to face trial for grand larceny. The tactic was endorsed by the Supreme Court (Ker v. Illinois). These renditions, like the case of Mir Aimal Kansi from Pakistan in 1997, were renditions to courts of law. But they are very different from the CIA’s current covert program of extraordinary rendition, in which terror suspects are sent not to justice but into the hands of rough allies. 2. FACT: Extraordinary rendition began under the Clinton regime. 3. FACT: The United States does send prisoners to other countries in the knowledge they will be tortured. In the course of researching the rendition program over four years, I’ve interviewed CIA pilots, case officers who’ve carried out renditions, senior CIA officers who’ve directed such operations and officials at the White House who have been involved in authorizing such measures. All of these sources acknowledged to me, in private or in on-the-record interviews, that claims by the White House that “we don’t send people to countries where they will be tortured” are lies. 4. FACT: The CIA has used rendition to outsource interrogation. Although renditions are used primarily to disrupt a cell and remove a terror suspect from the battlefield, they have also been used to gather intelligence. Before the CIA’s “black site” prisons were authorized by the White House in late 2002, some of the most important al Qaeda suspects were sent to foreign lands for questioning. Mohammed Haydar Zammar, alleged recruiter of the Hamburg cell (according to the 9/11 Commission) was rendered from Morocco to Syria under CIA orders (according to an official German government report). Ibn al-Sheikh al-Libi, described by former CIA director George Tenet as the “the highest ranking al-Qaeda member in U.S. custody,” was sent to Egypt for “further debriefing,” according to Tenet. 5. FICTION: CIA officers watch as rendition victims are tortured by foreign agents. Director Gavin Hood’s recent Hollywood movie Rendition is inaccurate to show a CIA officer ordered to stand watching while a prisoner captured with paper-thin evidence was electrocuted or waterboarded by some foreign agent. The act of witnessing such extreme torture close at hand and doing nothing would be tantamount to taking part -- a straightforward violation of article 18, section 2340A of the U.S. Criminal Code. If the prisoner died during such torture, a U.S. court could, in theory, sentence a CIA official to death. Yet, in some ways the truth about rendition is worse than depicted in Hood’s film. CIA rules may prevent its officers from witnessing strong-arm interrogations. But keeping one’s eyes wide shut, in effect, allows for much darker, more immoral things to occur, and the U.S. government preserves plausible deniability. 6. FACT: Hundreds of terror suspects have been rendered since 9/11. In a speech to the Council on Foreign Relations on September 7, 2007, CIA director General Michael Hayden said the numbers of renditions, in addition to the 100 sent to black sites, was in the “mid-range two figures.” The implication was that some 150 or so have been through the CIA’s own black sites or been rendered into foreign hands or both. Even such a high figure is likely to be an understatement. Many renditions organized by the CIA involved the help not only of other U.S. agencies, such as the Pentagon, but the practical assistance of other countries, such as Egypt and Syria. The United States government needs to account for the fate of more than 500 prisoners handed over to the United States since 9/11 by Pakistan, for example. All were rendered into U.S. custody without any extradition procedures. 7. FICTION: The CIA renders to foreign governments prisoners who it knows to be innocent. The CIA only carries out renditions with the approval of lawyers, after a file of evidence is assembled about a prisoner. No CIA officer would carry out a rendition if he believed the prisoner was innocent. The problem, however, is that evidence of guilt based on secret intelligence can be unreliable. The CIA does not knowingly render an innocent person, and it has acknowledged its errors when someone is found to be innocent. After the German citizen Khaled el-Masri was sent to Afghanistan in January 2004, he was almost immediately revealed as a case of mistaken identity. Yet, he spent a further 18 weeks in solitary detention in a CIA black site before Tenet authorized his release from jail. Even then, the agency has refused any public comment on his case. 8. FACT: In its own secret black sites, the CIA carries out its torture program. For many in the agency, the “enhanced interrogation methods” approved by George Bush – including, until recently, “waterboarding” and extreme methods of sensory deprivation -- cross the line not only as “inhumane treatment” (and banned by the Geneva conventions and U.S. law) but also as straightforward and illegal torture. Unlike the methods shown in the movie Rendition and used in countries such as Syria, Egypt and Morocco, the forms of interrogation used by the United States are carefully honed methods of psychological terror. 9. FICTION: The CIA kept its rendition program and black sites a secret from close allies like the Europeans. The CIA did not disclose the location of its black sites to its allies. But the U.S. administration, after 9/11, gave full warning to the world that it was holding prisoners at secret locations and that it had chosen not to apply the Geneva Conventions. America’s closest allies, including most NATO members, were also fully informed that a program of covert rendition was in use. 10. FICTION: After all the controversy, the CIA rendition program is effectively over. With all the protests in Europe and criminal investigations against the CIA in Germany and Italy in the last several years, the Agency has had to adapt its methods. The Supreme Court’s demand that the United States follow the Geneva Conventions has also meant the CIA must adapt its interrogation methods and limit its use of secret detention. But secret detention is not over. The CIA has failed to account for the location of at least 39 key prisoners captured since 9/11. Among the captives is al Qaeda camp commander Ibn al-Sheikh al-Libi, who was rendered to Egypt, then returned to U.S. custody in Afghanistan and has since disappeared. Although he and others may no longer be directly in the CIA’s hands, they are likely in the hands of proxies. And new forms of rendition have emerged. In the Horn of Africa this year, more than 90 people were captured with apparent U.S. involvement after they fled fighting in Somalia. The prisoners were rendered on a plane chartered by the Kenyan government into secret detention in Addis Ababa, Ethiopia. The prisoners reported later being questioned by CIA and FBI agents. Among the captives were a dozen women, including the wife of wanted al Qaeda suspect Fazul Abdullah Mohammed, as well as children and babies. 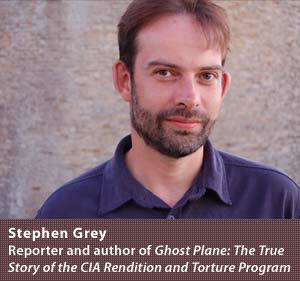 Stephen Grey is the author of Ghost Plane: The True Story of the CIA’s Rendition and Torture Program.